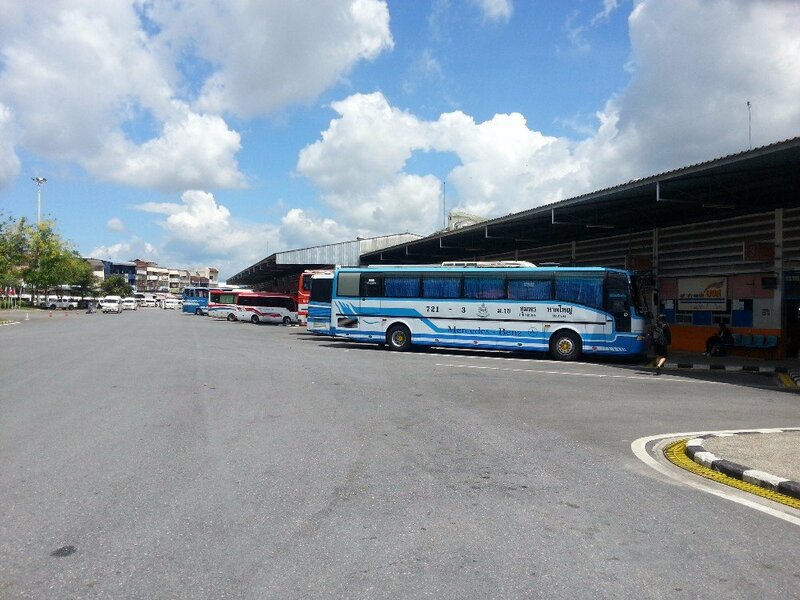 Hat Yai bus station is large and busy. Hat Yai is the largest city in Southern Thailand and it is the major transport hub for connections from Bangkok to locations in the Southern provinces and onto Malaysia and Singapore. Intercity buses, as well as minivans, depart from and arrive at this station throughout the day and night. Beyond the perimeter walls of the bus station there are also many private travel agencies offering private bus and minivan tours to a wide range of locations. Sometimes these agents offer a more convenient or more comfortable journey, but rarely do they charge less than companies operating out of the bus station. Thailand Life Tip: For the best value for money (with the exception of bus journeys to Penang and Kuala Lumpur) always catch the bus or minivan from the main bus station as it will be cheaper. Hat Yai Bus Station is 2.9 km away from Hat Yai train station and the three main streets in the centre of Hat Yai city (Niphat Uthit Soi 1, 2 and 3) where most of the hotels in Hat Yai are clustered. To get from the central area of Hat Yai from the bus station your best option is to take a motorbike taxi or a taxi van. Motorbike taxis and local blue taxi vans charge from 40 THB to 60 THB for travel between the city centre area near the train station and the bus station. 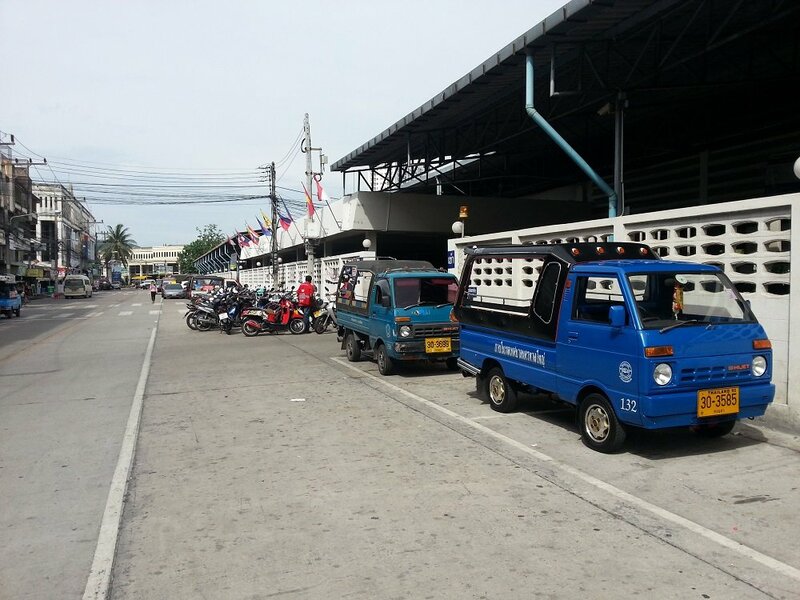 Immediately in front of the bus station on the same street as the private travel agents there are always motorbike taxis and small blue taxi vans waiting to take passengers into the city. It takes about 30 minutes to walk from the bus station to the train station, but be aware it is very easy to get lost if you try do try to walk as the first half of the walk involves lots of turns down side street, although once you have negotiated these smaller streets navigation becomes very easy as streets in Hat Yai city centre are laid out in a grid with the train station at the centre. 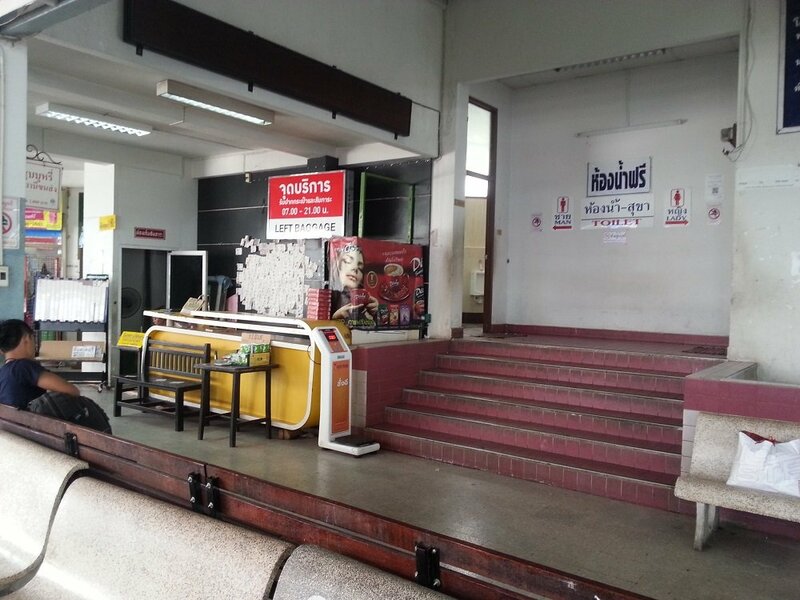 There are only a small range of facilities at Hat Yai Bus Station. 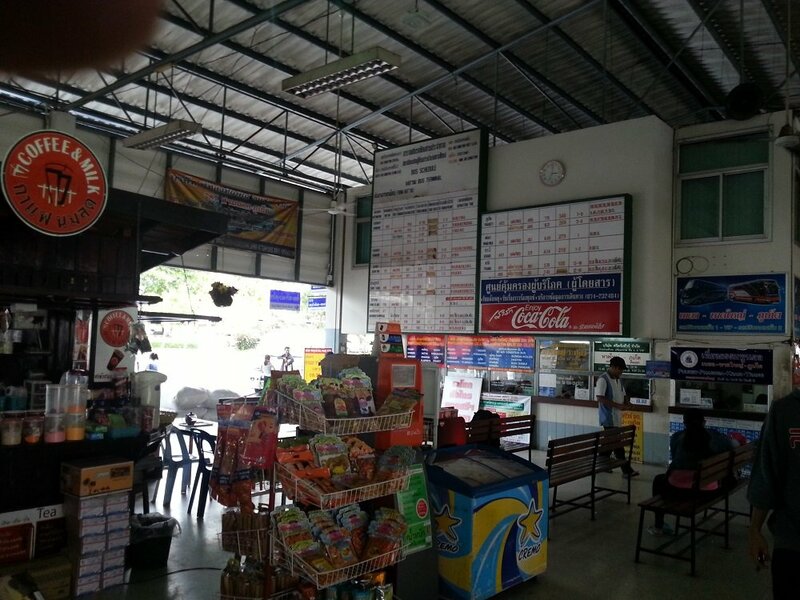 Despite being the main transport hub for bus services in Southern Thailand the station is long overdue modernisation and the facilities are poor in comparison to the newer bus stations in Bangkok and Phuket. Toilets at the both ends of the bus station. Left luggage office which is open 07.00 to 21.00. Information desk with English language speakers. Coffee shops and snack food shops. Tesco Lotus convenience store on the street in front of the station. Restaurants and food stalls on the street in front of the station. Inside the bus station there are many many ticket counter with glass screens each for a different company. Several companies may do the same route at different times and with different types of vehicles. Some of these can be booked in advance, others cannot and you simply turn up before travelling and purchase a ticket. Many of the counters have signs in English showing destinations, times and prices. Others do not. The best thing to do is to ask someone working at one of these counters and they will direct you to the correct one. From Hat Yai bus station you can travel to almost all destinations in Southern and Central Thailand directly, although you will need to change transport in Bangkok for onward travel northwards to Chaing Mai, eastwards towards Pattaya and north east towards Nong Khai and the border to Laos. There two companies with services to Bangkok which we recommend: Sri Siam Tour and Piya Company. We recommend these companies because they are reliable and use large comfortable modern buses. Cost: Tickets cost from 704 THB to 1,085 THB. There is a single company doing this route by minivan. The minivan will drop you near the border if you communicate this with the driver. You do not need to book this journey in advance. Minivans leave frequently. Journey Time: The journey takes 50 minutes. Cost: Tickets cost 50 THB. We recommend travelling with the Sri Trang company to Phuket. The bus to Phuket terminates at Phuket Bus Terminal (2) from there are plenty of local transport options for your onward journey to your hotel. Journey Time: The journey takes 7 hours 40 minutes. Cost: Ticket prices from 371 THB for the normal bus to 555 THB for the VIP bus. 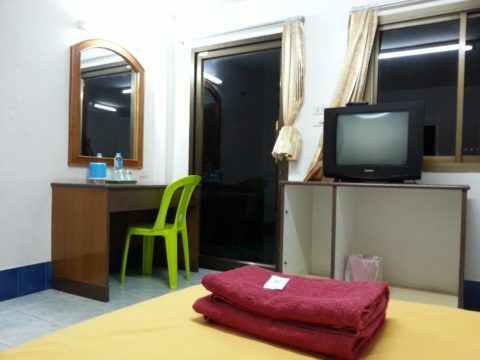 There are regular minivan departures from Hat Yai to Sungai Kolok. They tend to depart when they are full rather than on a fixed schedule. Fortunately, there are a lot of passengers wanting to do the journey so it is unlikely you need to wait long for a minivan. The fare is 200 THB (2016 prices) and the journey time is 4 hours, sometimes slightly less. The minivan will drop you at the border if you request it from the driver. Sungai Kolok bus station is about 2 km from the border. If you do end up being dropped off at the bus station it will cost around 70 THB to get a motorbike taxi to the border. Journey Time: The journey takes 4 hours. Cost: Tickets cost 200 THB per person. The Sri Trang Tour company uses large Express buses on the Hat Yai to Trang route. The bus terminates at the Sri Trang office in Trang town near the Phetkasem Road, which is the main road running through the town, and a 10 minute walk from Trang Bus Station. Journey Time: The journey takes 2 hours 15 minutes. Cost: Tickets cost 254 THB per person.